← Ludovicus, Celler Piñol, DO Terra Alta, Tarragona, Spain, 2008, 14% abv. There’s BC salmon on the dinner menu, so we need a Pinot Noir. Fully 100% Pinot, this wine won silver medals for 2011 at both the Canadian Wine Championships and the London, UK International Wine and Spirit Competition. The year 2009 marked the last vintage C&S used grapes from the Hollenbach family vineyards. Word on the street is they’ve not made a Pinot since as they wanted to find a vineyard they could monitor completely. With its light garnet core moving to a pale ruby rim and tender legs, this wine shows full on cherry, ripe red raspberry and oak with developing aromas of savoury earth and meat. It opened in the glass beautifully. On the palate it’s dry with average acidity and soft, velvety tannins. The alcohol is a little high but the body rests appropriately on the lighter side. Flavours of ripe raspberry and deeply ripe black cherries, tea leaves, gorgeous meaty and savoury tones and a beautiful vegetal, earthy and slightly smokey quality shine through. The oak on this is 20% new French and it was aged in 225 l barriques. Held for 10 months before being bottled, the wine has a long, silky finish. WSET Very Good – what a beautiful wine and it’s drinking beautifully. Love it, buy any bottles you can find and drink as often as possible. 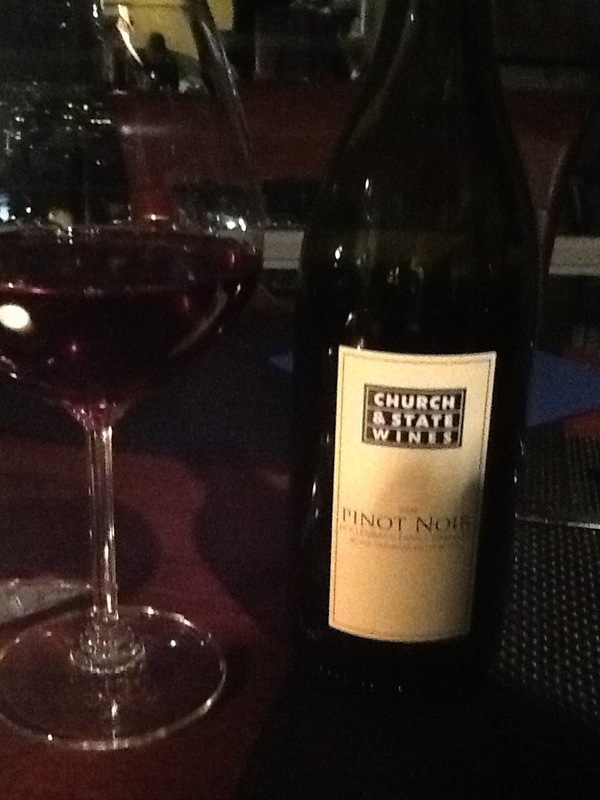 This entry was posted in BC, Pinot Noir, RED and tagged BC, Canadian wine, Church & State, church and state, Hollenbach Family Vineyard, Okanagan Valley, pinot noir, red wine. Bookmark the permalink. Glad you liked it. No further pinot from C&S, I can assure you.